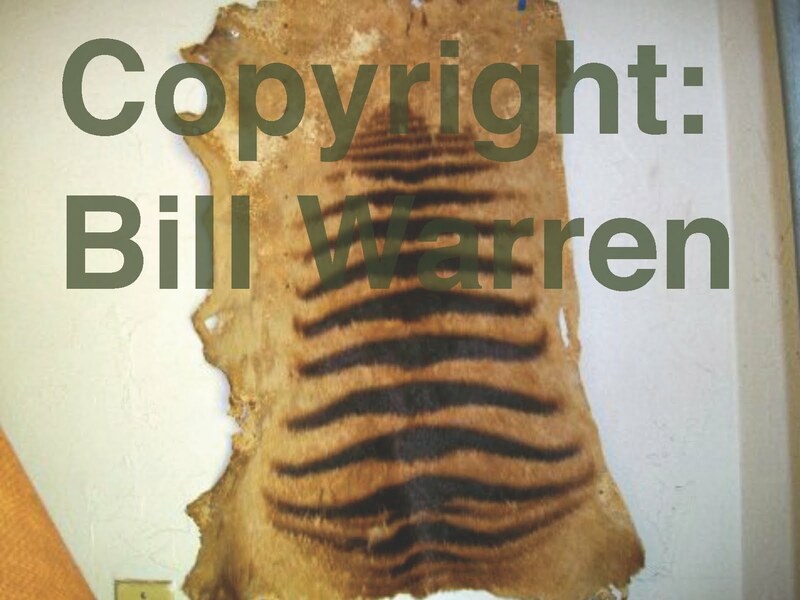 Several months ago we were contacted by American Bill Warren with an incredible story - he claimed to have a Tasmanian Tiger pelt in his possession. We were somewhat dubious as he was, after all, in America - but it was certainly not beyond the bounds of possibility considering several American museums have some very good Thylacine specimens in their collections. Why not a pelt of a highly prized extinct animal in private hands? Bill emailed us the image above and we began a dialogue about the skin's authenticity. We advised him that he would need to seek out verification the pelt was in fact of a 'marsupial wolf' before it could be sold, and agreed to keep the matter confidential until such time as Mr Warren went public with his story. This week his tale is featured in an edition of the San Diego Union-Tribune. He picked up the pelt for $5 at a garage sale - $5 is cheap for any kind of animal pelt, particularly one that could be of an extinct animal. The last time anything like it went to auction was in 2002 when a rug made of pelts was sold for $270,000 (that's Australian dollars) to the Tasmanian Museum. 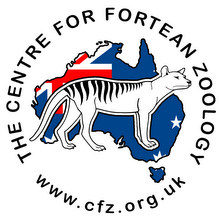 We advised Mr Warren about that auction's results and again suggested he get the pelt tested/analysed by experts before seeking to sell it, and discussed the legalities of trading such a rare skin across borders, given the likelihood of strong interest from Australian museums should the skin be genuine. 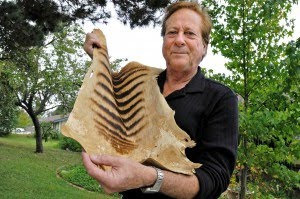 Professor John Long - formerly of Museum Victoria in Melbourne and now based at the Natural History Museum of Los Angeles - also told Bill that while the skin may appear at first glance to be Thylacine, genetic tests would be needed to confirm the skin's identity. In our discussions with Bill, we also suggested the possibility his skin could be that of the vulnerable Zebra Duiker, a small deer-like animal native to Côte d'Ivoire (Ivory Coast), Guinea, Liberia, and Sierra Leone. He was adamant it was not. We' love to believe it's a Thylacine, but the absence of tail skin, and the darkness and number of stripes leave the gate well and truly open to the possibility the skin is that of a Zebra Duiker. 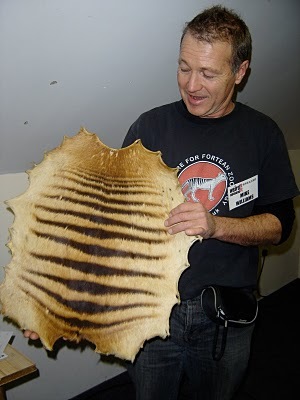 At the recent CFZ Weird Weekend 2010, Dr Lars Thomas brought along a skin that had been bequested to a Danish Museum that he had been tasked to identify (Mike Williams holds the skin in the picture above). 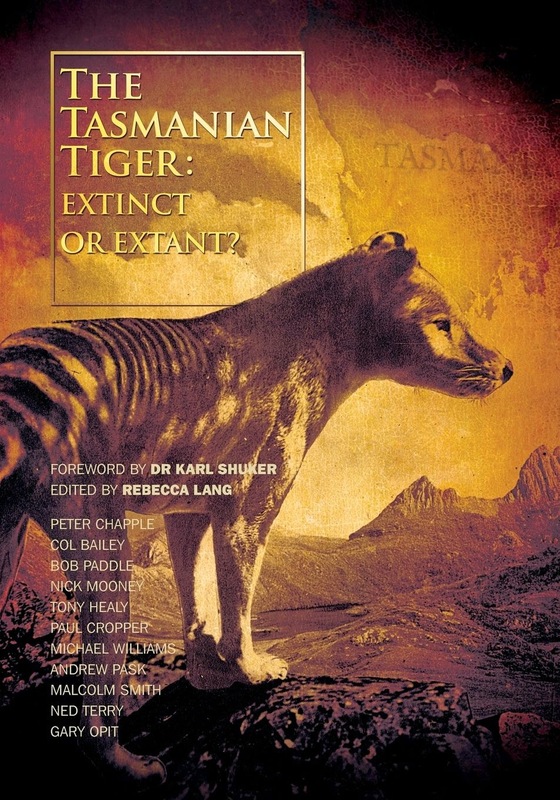 At first glance, after Lars extracted it somewhat unceremoniously from a plastic bin bag, most mystery animal enthusiasts were adamant it was the skin of cryptozoology's Holy Grail - the Thylacine. But attendees were also aware of another possible identity for the skin, and over the course of the weekend it ultimately proved to be that of a Zebra Duiker. An important lesson learned! 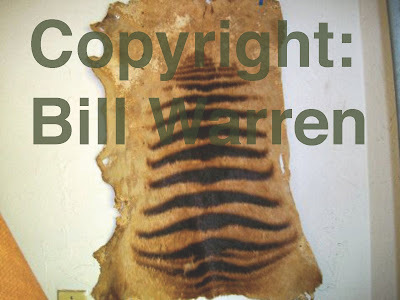 Only hair and DNA testing can confirm the identity of Bill Warren's pelt. Thank you for sharing Bill, we await the results with interest!